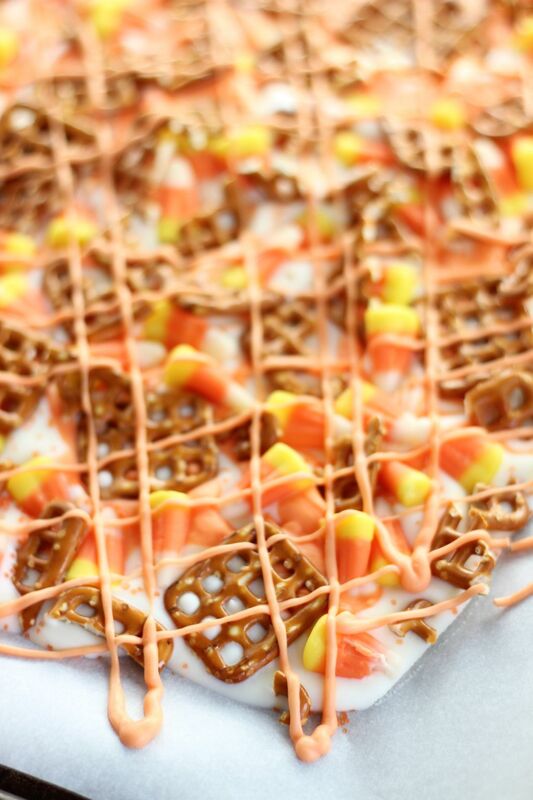 This candy corn bark is ready in minutes! 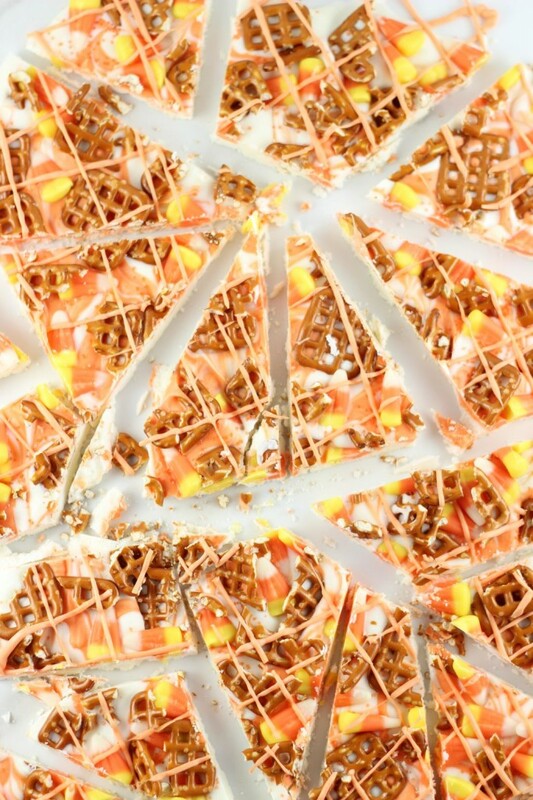 Silky white chocolate sprinkled with candy corn and salty pretzels, it’s a sweet-and-salty Halloween candy delight! Let me tell you how this recipe went. 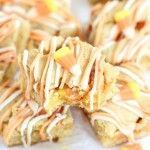 The day I planned to make this bark, I ran out of candy corn making these Candy Corn White Chocolate Blondies. 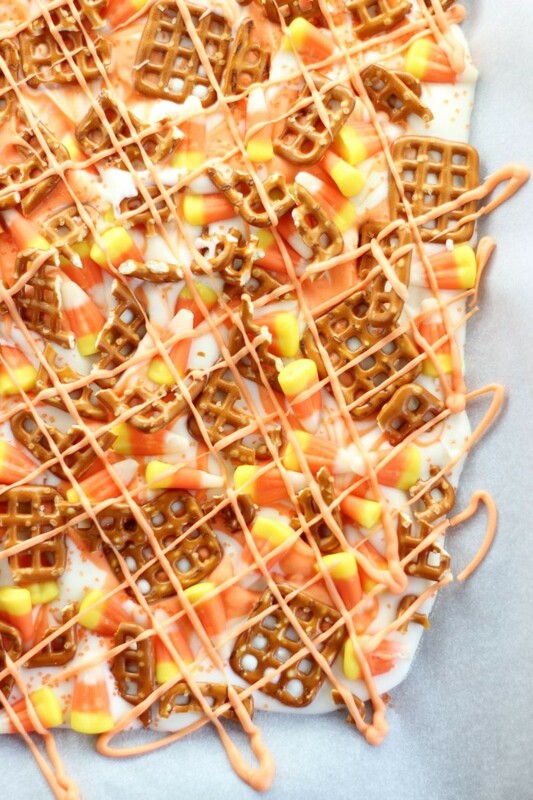 I was making many of these Halloween recipes back in August! When he came home, I asked him which ingredient really did him in… he usually struggles with finding all baking ingredients (I do not understand this?? They are generally all in one or two aisles!! ), but one typically causes him more grief than the others. I was surprised to hear that it was the candy corn. I noted the day – it was August 30th – why on earth didn’t Publix have candy corn then? How very unreasonable. Okay, so it’s not, it was only August, but stores are always sooooo far ahead on holidays. I should mention that I found candy canes and Christmas decorations at Sam’s Club in August, but no candy corn. Mystifying, isn’t it? He tracked it down eventually at a different store, and our relationship survived that test. Ingredient runs can get a little dicey around here. 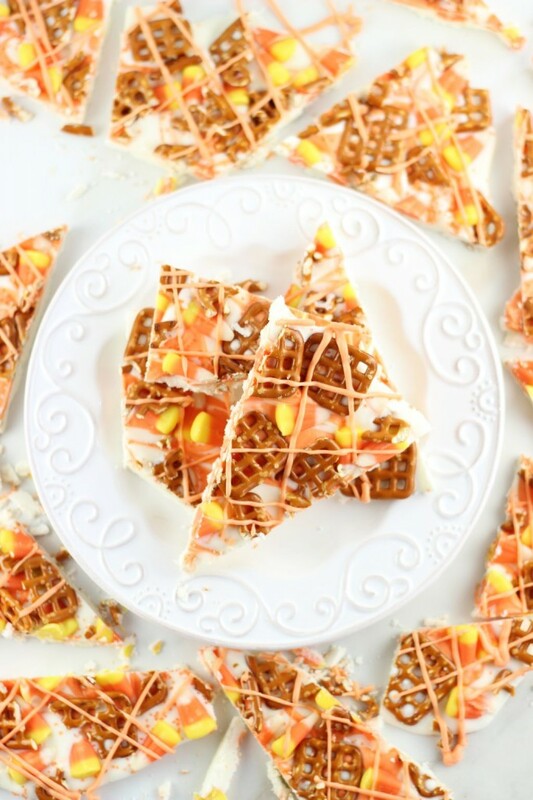 I’m sure he’d tell you it was worth it so that I could bring you this Candy Corn Bark recipe! 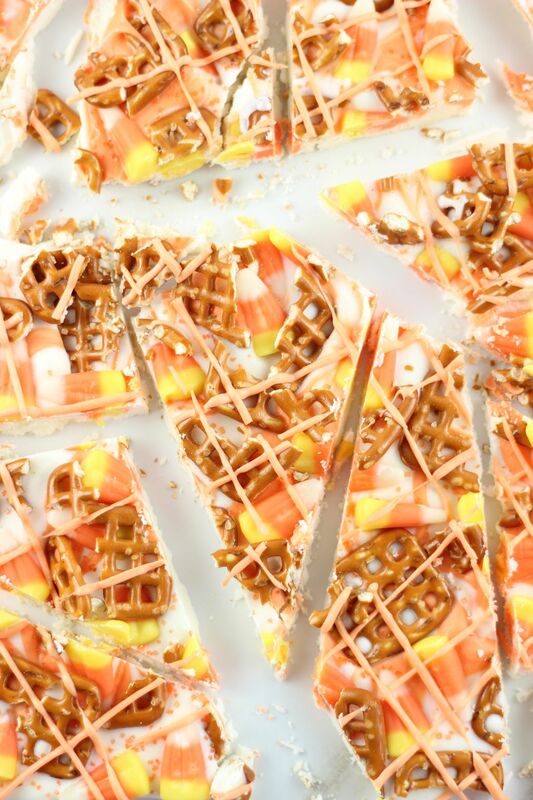 Smooth white chocolate is sprinkled with candy corn and crushed pretzels for that perfect combination of sweet-and-salty. 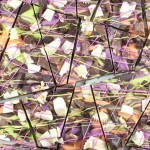 If you’ve never known the deliciousness of silky white chocolate with salty pretzels, than this is a must-try candy. 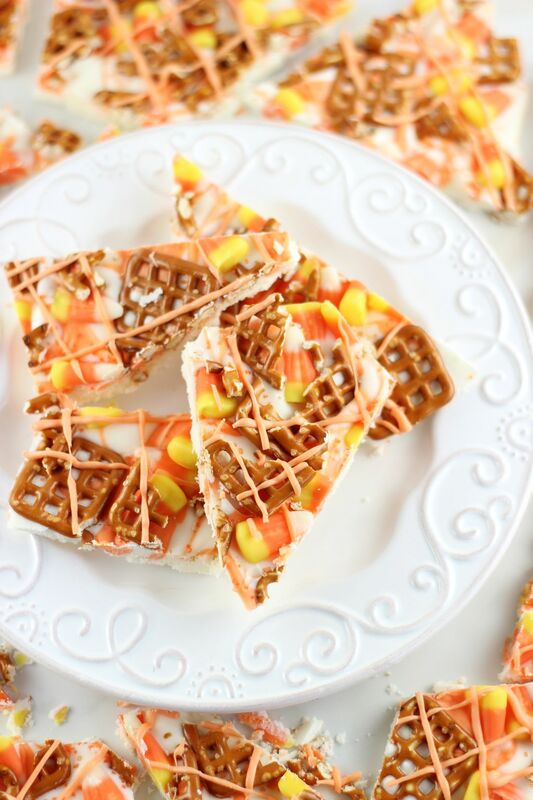 Adding candy corn for seasonal flair, you can make this in the microwave in just a few minutes, and it’s a fun and festive treat! 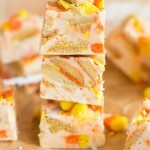 Silky white chocolate sprinkled with candy corn and salty pretzels, it's a sweet-and-salty Halloween candy delight! 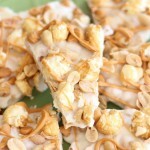 Microwave the almond bark at 30-second intervals until melted and smooth. Spread it onto the parchment paper in a thin, even layer. 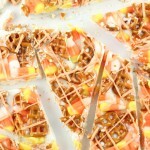 Sprinkle the candy corn and pretzels over the chocolate, pressing lightly to adhere. In a small microwave-safe bowl, heat the orange melts at 15-second intervals until melted and smooth. Allow to set completely, and break or cut into pieces. This looks like such a fun idea! I can see making something like this with left over cereal and whatever nuts or fruits i have on hand! Great post and thanks for bringing this by to throwback Thursday! Oh my!! 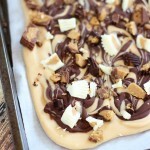 A few of my favorite things in one recipe! This looks amazing I can almost taste it! Pinned it for later. Thank you for sharing. Blessings always. Misty. Lol! Candy corn is dangerous… what makes it so good?? I love this bark. Thanks, Josette!